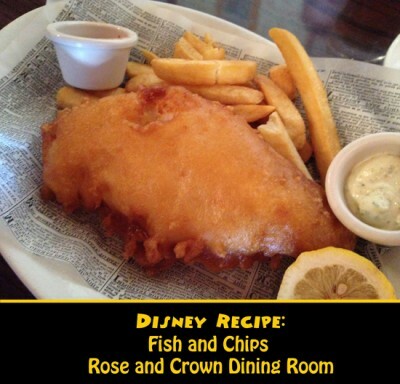 One of the most popular dishes in all of World Showcase would have to be fish and chips. There are two places you can get the delightful treat. One is at the Yorkshire County Fish and Chips booth and the other is at the table service location, Rose and Crown. While both serve great fish and chips, the recipes are actually a tad different. I’m here to share the recipe for the Rose and Crown’s version. Fish and chips is a great snack or meal and the recipe seems pretty simple…and perfect for dinner tonight! I know what I’m making! 1. Cut fish into fingers about 2 ounces each and place in a glass or stainless steel pan. 2. Mix lemon juice with Worcestershire sauce, salt, pepper, and vegetable seasoning. 3. Pour over fish and marinate in refrigerator for 1 hour, turning every so often, coating the fish. 5. Remove fish from marinade, drain, dip in batter and fry in hot oil for about 5 minutes, turning to brown both sides, if necessary. 6. Remove from oil and drain on paper towels. 7. Serve with chips and malt vinegar. 1. Mix cornstarch, flour, salt, sugar, and pepper. 2. In a separate bowl, beat water, egg yolks, and beer together with a whisk and slowly add dry ingredients. 3. Continue to mix with whisk until mixture is smooth. 4. Stir in baking powder. 5. Makes enough batter to coat 3 pounds of fish.